ESA's (Electronic Substance Abuse) sound is always a hard one to pin down. Taking influences initially from rhythmical noise acts, the overall structures have developed and integrated countless influences from the broad spectrum of alternative and extreme music. The tone of ESA is harsh and oppressive, dripping with destructive and corroded grooves whilst still emanating sub conscious melodies and a strong sense of Spirituality. ESA's compositions are undoubtedly threatening and offensive floor stomping club tunes but also twist and churn enough to warrant more attentive listening. 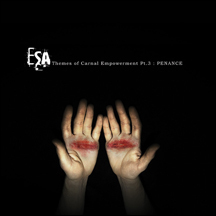 With the much revered 'Themes 1 & 2' releases causing such a stir within the noise and harsh industrial scene, ESA's creator, Jamie Blacker, is ready to unleash the closing album to this destructive trilogy; Themes of Carnal Empowerment Pt.3 : Penance. From the anthemic rhythms of "Be Still and I Shall Tell You Why" to the tribal chants of "Juju Yako," Blacker calls this ESA's most complete work to date.